Russian internet users reacted humorously to the closure of three Moscow McDonald's restaurants that had allegedly breached sanitary norms. The fact that one of the closed outlets, the one on Pushkin Square, was Russia's first McDonald's merely added spice to the debate. 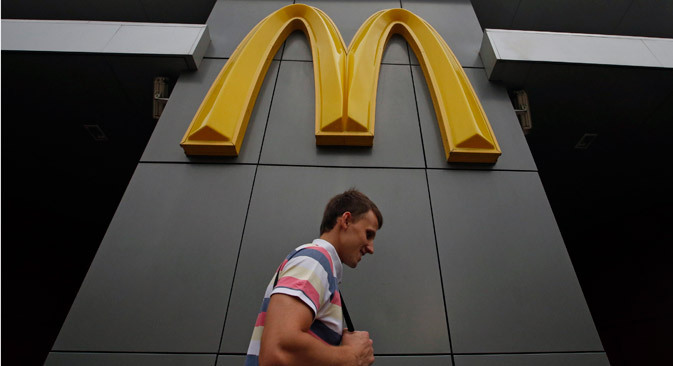 On August 20 three McDonald's restaurants were closed in Moscow for having reportedly failed to observe sanitary norms introduced by government monitor Rospotrebnadzor. A fourth was also held to have violated norms but escaped closure. As a consequence, a wave of checks was launched at other McDonald's branches throughout the country. Meanwhile, Russian internet users have already linked the event to the so-called ‘sanctions war’ between Russia and the U.S. and the intrigues of Russia's fast-food competitors. They also took the opportunity to explore all the stereotypes related to the popular fast-food brand. One of the closed restaurants was the famous McDonald's on Pushkin Square, the first to be opened in the USSR, symbolizing the advent of capitalism. Many users published photos of the enormous lines around the restaurant in 1990, the year of its opening. @golub: Our grandfathers fought for a double cheese. @AveMisha: I was silent when they came for my freedom of assembly. I was silent when they came for my freedom of speech. BUT I WILL NOT LET THEM HAVE MY RIGHT TO BE FAT. @Dobrokhotov: I walk by an empty McDonald's and see journalists interviewing puzzled people about American-Russian relations. @twitted_knitter: 2016. A Duma deputy, having learned that there is nothing more to prohibit, went out and kicked a dog. A new niche for Russian fast food? @korobkov: How much did Kroshka Kartoshka [a Russian fast-food chain offering baked potatoes stuffed with various salads - RBTH] pay to have the three McDonald's closed? Other users found a way to poke fun at traditional fast-food themes: unhealthy food and overqualified personnel. @crazy_kutas: They are closing all the McDonald's restaurants in Moscow. Where are people with a humanist education going to work now? @yasviridov: McDonald's has three Michelin death stars. @twitted_knitter: Attention, McDonald's is closing! Next stop - a slender figure. Finally, the online publication The Village has published a heart-rending photo reportage from the closed McDonald's on Pushkin Square.